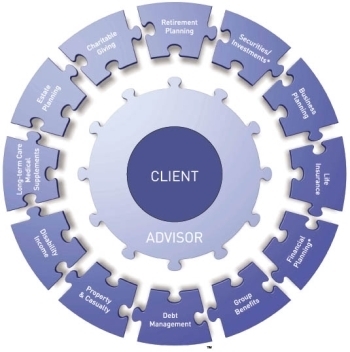 Let the professionals at Financial Partners Group simplify your life with a fully integrated financial program. We’re “partners in your big picture”. Financial Partners Group is a financial services firm that provides professional personal guidance for individuals and businesses in all areas of financial services. Like pieces of a puzzle, all elements of your financial picture are interconnected. You need a life plan…a clear vision of the big picture. Our TEAM APPROACH coordinates subject matter specialists who provide a personalized “brain trust” with independent, objective and in-depth analysis. "OUR MISSION is to provide clients a single source for the highest level of experience in all aspects of their financial lives... to fully utilize each professional’s unique ability... and to uphold an environment where integrity, compassion and values solidify our relationships with business associates, clients, and the community."